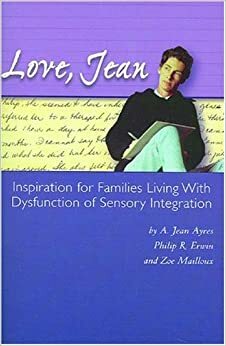 The book is unusual in that it is a compilation of letters written by a.Jean Ayres who pioneered Sensory Integration theory and practice to her own nephew Philip R, Erwin, Philip’s story is written in his own words and there are many fantastic chapters written by Zoe Mailoux who was one of Jean Ayres’ first research assistants. Philip had sensory processing difficulties but was unable to be treated directly by Jean Ayres or any other OT and so he engaged in an education and consultation process with his Aunt via letter. This indirect long distance “therapy” by letter consisted of consultation and monitoring – advice and recommendations which included sensory strategies. It was life changing for him as it has been for our family. I am so passionate about access to SI intervention for as many children as possible because I have watched a similar transformation in Charlie. It is touching my heart to read about the impact of SI by someone who had experienced it directly and was able to write about it in his own words. It is so encouraging when the going gets tough to remember that it is worth all the effort, and this is why. Here is an extract from the book where Philip describes how Si changed his life. “Looking back I remember the feeling of calm that came over me as I went through the therapy regimen so long ago. Before I started scooter boarding, I felt like I was trapped in an exoskeleton. I was all corners and edges. I moved in limited, uncomfortable patterns. When my bony carapace and I bumped into unexpected objects, my hardness made compromise impossible. I had to back up and yield. I had to constantly pick routes through life that wouldn’t trap my bones and me in tight corners or dead ends out of which I would be unable to extract myself. But after scooter boarding for a while my hard, exterior shells fell away. I became suppler. When I met an obstacle I was often unable to move delicately around it, perhaps squeeze by it, or mold myself into a shape or configuration more in harmony with it. After months of therapy, I had shed and regrown my shell so many times but less and less of it grew back after each shedding. There is now so much evidence for life long neuro-plasticity, Philip was older than the ideal age for starting SI therapy however the results of following his programme of sensory strategies were still enormous. We often search for complicated answers, strict protocols or diets to effect change for our kids, we want a recipe that works…Philip says this about what worked for him, it made so much sense to me that I wanted to share it with you.